As seen in my previous post, I’m planning on going to Dragon*Con 2012. It is official. I’ve bought my pass and round-trip flights. Now the countdown really begins. (Really is underlined as I have a countdown going in the previous post. Thought it was a under-cover humor drop). I’m saving you from all of the exclamation points I really want to type right now. Here’s how my previous sentences may have looked if I hadn’t sat to think that people on the internet may actually be reading this : OMG! Dragon*Con… squee!!!! I can’t wait!!! Everything is booked!! S-O E-X-C-I-T-E-D!! 45 days, come on now! With that said, I’m starting to plan my “costumes” for the four days I will be there. We still aren’t sure exactly what and who we will get to see, but no matter what this will be an awesome experience. I’m going with a friend, and mutual geeky-gal, so we can have nothing but fun. Especially when both of us love Battlestar Galactica. 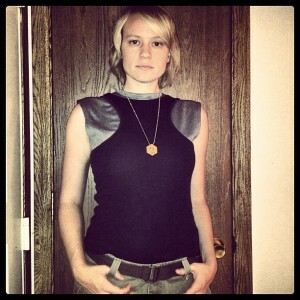 As a result, we are planning on Battlestar outfits. I went shopping the other day, looking for a way to make our own costume and I struck platinum. Not gold, but pretty gosh darn close! And not bad prices either. Since things are turning out so well for this costume, I thought I’d share in case anyone was wondering how to make their own Battlestar Galactica Starbuck (or other crew) Costume. Depending on how authentic you want to get, be prepard to pay more. I like to pay less – so this is the platinum version. Now, since the sleeveless shirt is a man’s shirt, I’ve got a little problem to work through. Nothing a little sewing can’t fix. Underneath the arms the material is too loose, not fitting tightly next to my skin. I’ll post more details once I do it, but it should be just a matter of making a tighter seam or possibly one of those dart things. (Before you ask, no I don’t sew much. I fix holes and the last major project I did was five years ago when I made my Jedi cloak. Yeah, remind me to tell you exactly how much fun that project turned out to be). I also think the fabric hangs over my shoulder just a bit too much when compared to the real thing, so I may adjust that as well. Depends on my bravery, I guess. The pants I found will be going back. As they are men’s also, they just don’t fit right. I don’t want tight pants, but the looseness on these is a bit ridiculous for me to look the part. I may need to hunt several stores to find any women’s cargos this time of year. As I have just ordered the leg holster I don’t have any pictures yet, but I’ll update as soon as I do. The thumb ring I’m debating. I don’t have a need for one otherwise, so I am in no mood to spend more than $5.00 on it. Still hunting for it, but it would complete my outfit the way I see it in my mind. Well, there it is. More to come and of course more pictures as I complete this and my other outfits! Update 08/23 – I have finally bought the plain thumb ring and have sewed the shoulder/armpit areas to be less….. big. Love the costume and love how you are taking the time to go on vacation and to dragon con. All I can say is if you see my other hubby take pictures! Haha Danielle. Yes of course.